I haven't mentioned Kate Nash much (it's not like she needed the attention!) but I have really enjoyed her last single and her latest one 'Mouthwash' so here we are. I was a bit apathetic following her debut release of 'Caroline's A Victim'/'Birds'. I thought 'Birds' was a bit lifeless and 'Caroline's A Victim' was a complete mess - anyone who listened to that was a victim. Still when I threw out the idea that 2007 could be the year of the solo artist [link], I would never have expected Kate to have already reached such heady heights. Even with the early hype, I don't think she would have got so far had 'Foundations' not really become one of the huge summer hits (I would say THE summer hit but 'Umbrella' pretty much took that crown). And deservedly so. Both musically and lyrically, Nash uses a simple approach and yet therein lies her charm(/other people's hatred of her). Having a producer of the calibre of Paul Epworth helps too. link]. I thought I would share the fruits of that session with you all. Christ almighty, what is she wearing though? 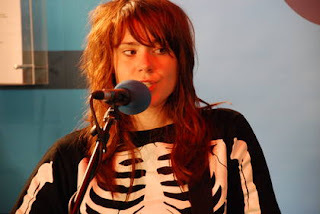 I realise this was a RADIO session but her skeleton top is an abomination. But music is more important than fashion so let's move on. The single version of 'Mouthwash' is superior to this stripped down version but that's more because the produced version is pretty great. It's just good pop really. Why on earth the video is an homage to Starlight Express is beyond me though?! The session version of 'Birds' adds a lengthy intro and the addition of a few other instruments compliments the song well but there seems to be something so staid about the whole thing. There's also a free download on offer via her website of a Tapedeck remix of 'Caroline's A Victim', which is slightly better than the original in a S Club 7 meets Hadouken! way. I think I was a bit over exuberant with the filename and stuck an extra Tapedeck in, the mp3 tag should be correct though. 'Mouthwash' is released on the 1st October. Preorder at HMV [link]. Buy Kate's debut album 'Made Of Bricks' from Play [link].